I repeated the plasmid transformation tests, using the same two plasmids but this time using plasmids prepared from both E. coli and H. influenzae, transforming each prep into both RbCl-competent E. coli and MIV-competent H. influenzae. First consider plasmid pSU20, a small low copy-number plasmid with no H. influenzae uptake sequences. When grown in E. coli, this gave about ????? 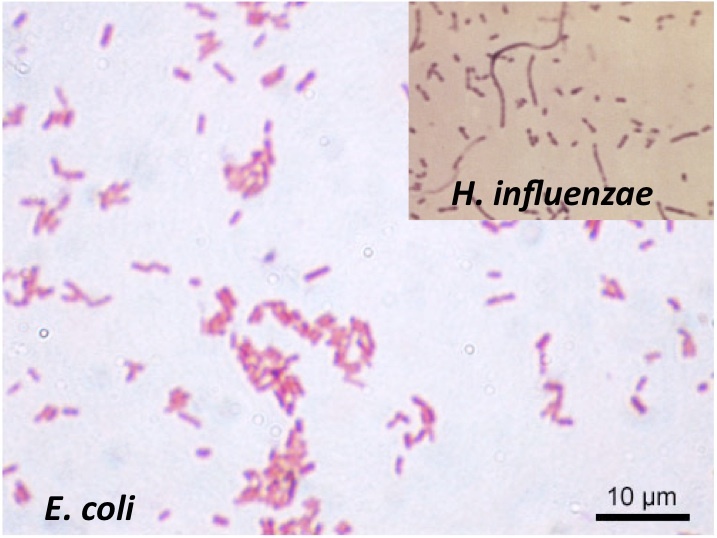 transformants in E. coli but none in H. influenzae. The same plasmid grown in H. influenzae gave about 330 transformants in both E. coli and H. influenzae. (The two plasmid preps were used a different concentrations, but for each the same concentration was used for both E. coli and H. influenzae.) This result tells us that H. influenzae cells do take up plasmids that have no uptake sequences, but that the plasmids from E. coli don't survive, probably because they lack methylation to protect them against the H. influenzae cells' restriction enzymes. The situation is more complicated with the other plasmid, a pSU20 derivative containing a 9.3 kb insert of H. influenzae DNA. The insert has several uptake sequences, but it also carries the gyrB gene and appears to be quite toxic. The E. coli-grown plasmid gave only about 400 transformants in E. coli but more than 2000 in H. influenzae. This was a high-concentration plasmid prep, so I think the high concentration must have allowed some plasmids to escape restriction, and the low transformation of E. coli must be because the insert is toxic. The H. influenzae-grown prep gave fewer transformants, about 160 in H. influenzae and fewer than 10 in E. coli (no colonies from 100 µL of transformed cells). Conclusion: Yes, plasmid transformation definitely does work in H. influenzae, but it doesn't work especially well.